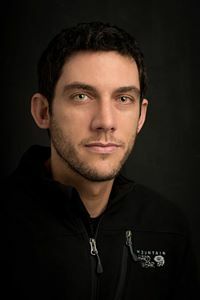 I’m a professional nature photographer, and I’m especially fascinated with the arctic. 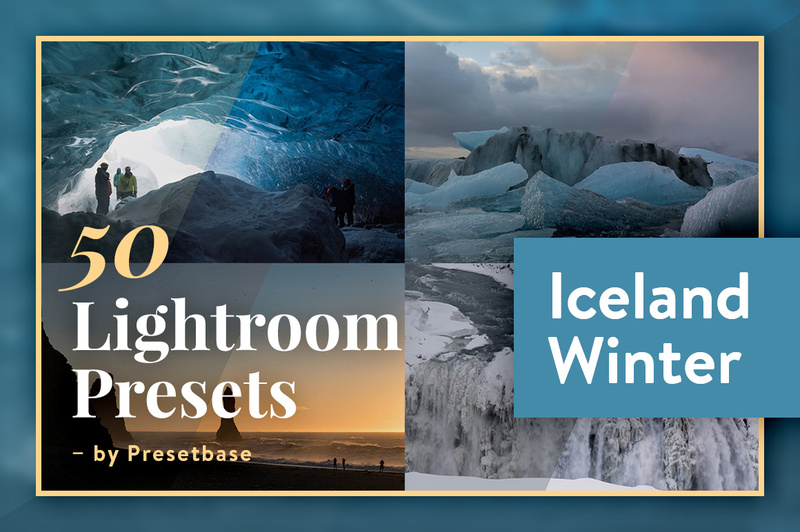 I’ve spent over 3 months of my life in Iceland, all during winter, and I’ve captured many images of its magical frozen landscape. Black beaches adorned with countless diamond-like icebergs, glacial lagoons, ice-crusted waterfalls, Northern Lights, ice caves… Iceland in winter is a true paradise for photographers, one that I go back to every year to shoot and guide. One of the most amazing sights I’ve seen in Iceland was the opening to this ice cave in Vatnajökull Glacier. The patterns, colors and reflections were mind boggling, and conveyed the true sensation of being inside a natural wonder. 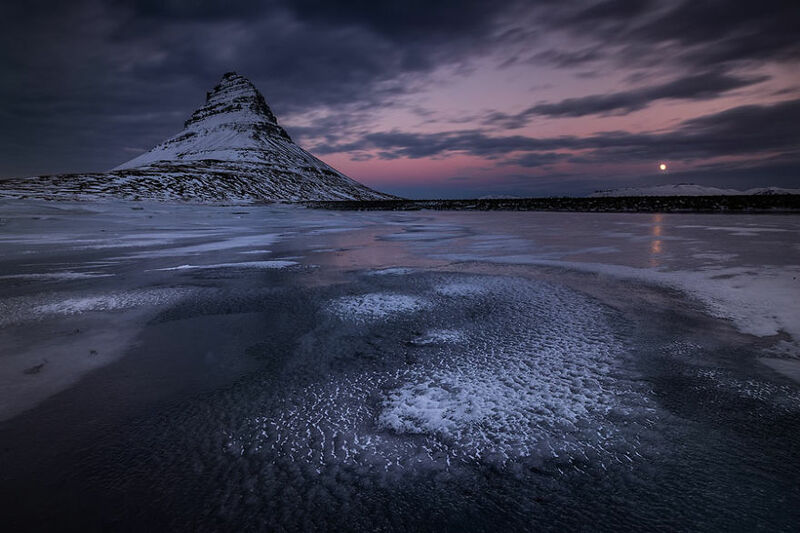 A red moon rises at the famous Pyramid Mountain, Kirkjufell. The frozen lake I was standing on was sprinkled with beautiful patches of snow, complementing the dramatic darkness all around. 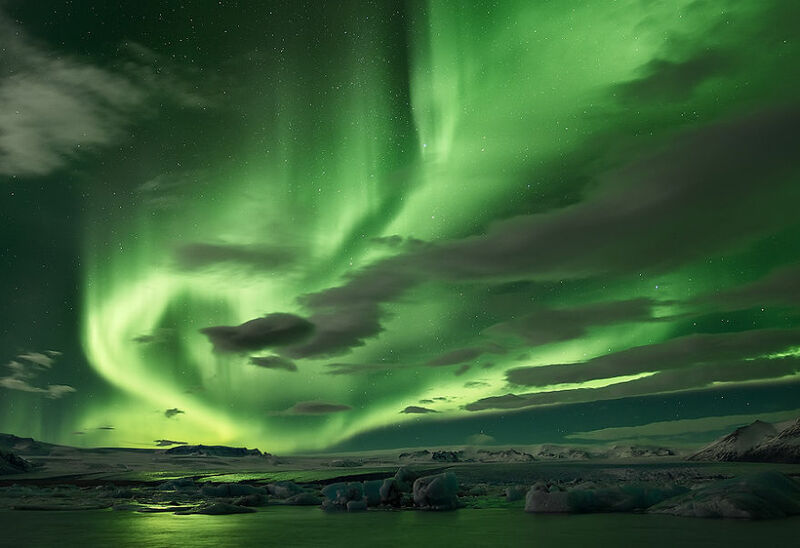 An amazing night of Aurora Borealis over Iceland’s famous Glacier Lagoon. The shapes that the Northern Lights take never stop mesmerizing me. 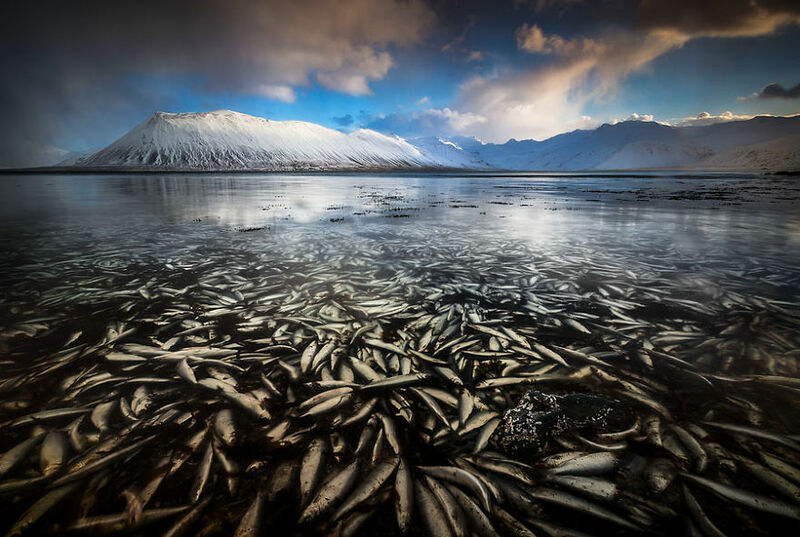 Tons upon tons of herring found their demise in this bay, smothered from lack of oxygen in its waters. It was a sad scene indeed, a good reminder of life’s frailty. A top-view shot during a true winter day in Godafoss. A truly spectacular waterfall, the waters of the river Skjálfandafljót fall here from a height of 12 meters over a width of 30 meters. During winter, the river remains liquid but a wonderful icy crust envelopes the horseshoe-shaped waterfall. Arguably the most beautiful and impressive waterfall I’ve ever seen, Aldeyjarfoss is even more impressive in its frozen winter clothing, and this image doesn’t begin to do it justice. In winter, it is reachable only by super jeeps, but getting there was definitely worth the hardship. The 20-meter-high waterfall is part of the river Skjálfandafljót, and is famous for its hexagonal basalt columns, belonging to the Suðurárhraun lava field. ​Our guide to this amazing ice cave, Helen, at the cave’s opening. Icelandic girls are something special for sure! ​The famous Dinosaur Rock in the beach of Hvítserkur, under a spectacular sunrise. The amazing waterfall of Hrafnabjargafoss, beautifully covered in fresh snow, was one of the most memorable sights we witnessed during my 2014 ‘Winter Paradise’ workshop. It takes a wild super-jeep ride to get to the waterfall during winter, but to witness it in such pristine conditions is a truly magical experience, well worth the trouble. ​A beautiful waterfall, surrounded by ice-crystals in a hidden, underground ice cave deep in Breiðamerkurjökull glacier. ​A spectacular night of Northern Lights above Iceland’s famous glacier lagoon, Jökulsárlón. Almost 5 minutes of exposure turned clouds into fluffy whipped cream, over a perfectly-still Glacier Lagoon. A truly spectacular sunset in Jökulsárlón. In one of the most enchanting afternoons in my 2014 ‘Winter Paradise’ workshop, we encountered a hazy, snowy, tranquil Lake Mývatn. The haze, the golden sunlight and the perfect reflection of the snowy tree supplied the ultimate conditions for a winter experience none of us will ever forget. One of the most majestic ice caves I’ve seen was this beauty, hidden in the depths of Mýrdalsjökull glacier, reachable only by a tough super jeep ride to the depths of the ice. 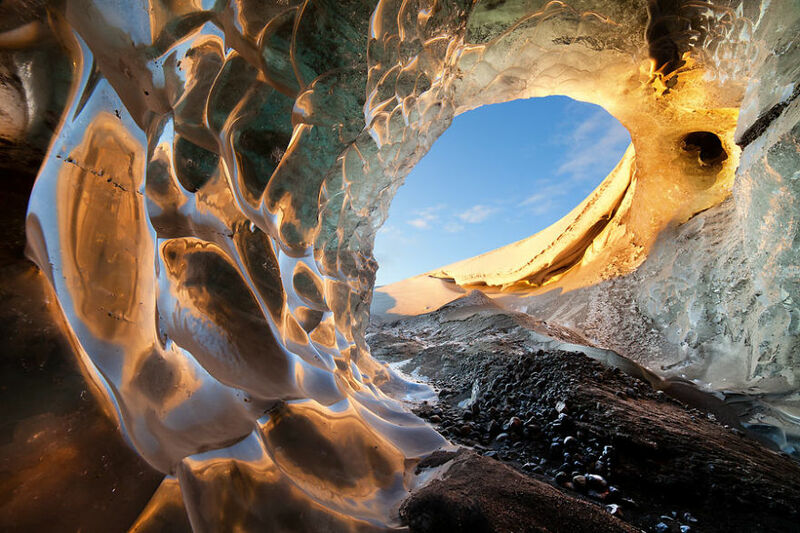 Sometimes you just have to stand in awe of the unbelievable formations nature can craft. ​I was travelling with friends prior to starting my Iceland workshops, and on one of the days, we had the chance to visit Skógafoss in perfect conditions. There was very little wind, the waterfall was covered in snow and to top that, a beautiful rainbow had appeared, as the southern sky was clear. What more could we ask for? Shy is a dear, dear friend, but he has a very annoying habit of entering my shots at the exact time it’s most intruding. Luckily, on this one he made the perfect addition to this amazing ice cave. A hellish midday in Vik, Iceland. We decided to go to the beach inspite of the ominous weather, to get some true winter shots. I guess one should be careful what one wishes for… What we got was a relentless hail/snow/whatever it was just hitting us from every direction possible. We stood there like penguins trying to remember why the hell we went out of the warm car when it struck us that you just NEVER see images of Vik in such conditions. The tiny frozen white spheres on the pitch-black beach were just surreal, and addded to the beautiful stacks of Reynisdrangar, this was a scene well worth the icy adventure! I can't almost believe that it's all real. Oh! How I wish I can be there in Ice Land too to see the Aurora Borealis.